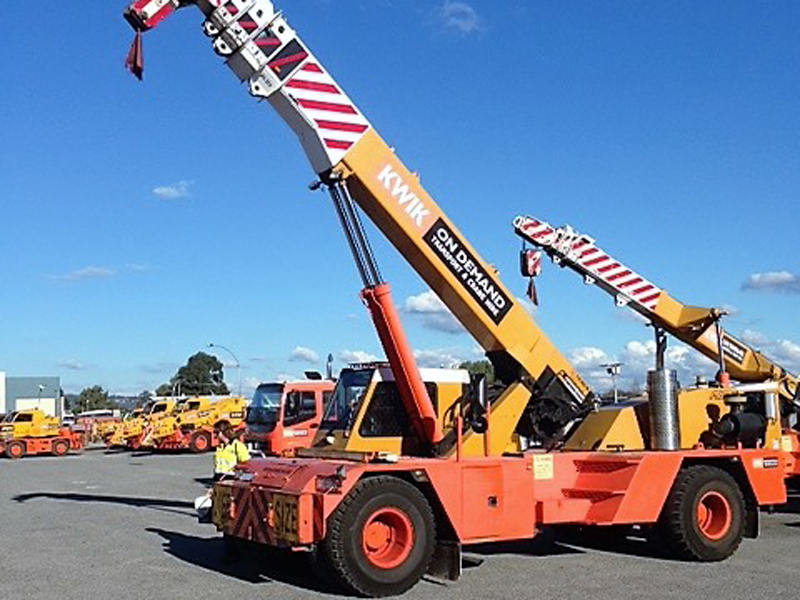 At Kwik Logistics, we provide high quality crane hire in Perth to suit all projects. We have a range of cranes to suit any job, and can provide advice on the best crane for you depending on your project requirements , including site layout, access, and materials to be moved. We offer the largest selection of pick and carry cranes to help you complete your project quickly and safely. Explore our range of mobile pick and carry cranes to find out more about how Kwik Logistics can help you complete your project. Pick and carry cranes are aptly named for their ability to lift heavy loads, and transport them to another location while suspended. Their specialised design means that they are able to move loads without the need for outrigger support. This makes them ideal in sites with limited access, as they have the flexibility to avoid obstacles and perform in situations other larger cranes may not be able to fit. Furthermore, with an articulated frame that performs without outriggers, these pick and carry cranes are able to get established on site quickly and reduce time spent on the job. These all terrain 4WD cranes are reliable in all sites, and are ideal for soft or boggy conditions. Franna have been a manufacturer of quality cranes and an industry leader in Australia for decades. Initially founded in 1980, the first crane was developed from truck components. Franna was acquired by Terex in 1999, and today Terex-Franna cranes are some of the best cranes in the industry, having developed a reputation for quality and safety. Franna cranes offer the latest designs, creating a powerful crane that is versatile and suitable for a wide range of environments, from workshops to industrial sites and mines. The operator cabin is built for function and comfort, with a spacious interior, well designed dashboard, and digital load display. 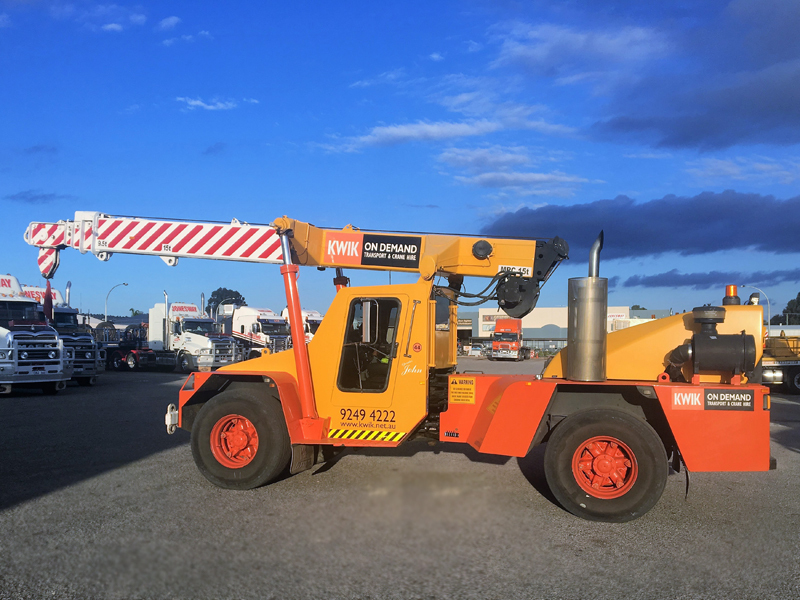 Kwik have been utilising Franna cranes since our inception and have the most well-trained operators to undertake the task. Franna Cranes are available with 15 tonne, 20 tonne, 25 tonne or 25 tonne Super Lift, depending on the needs of your project. We also offer the TIDD Crane, manufactured by TRT New Zealand. With a maximum lifting capacity of 25 tonne, this crane meets the highest demands. This compact crane combines operator comfort with all the modern safety features you expect. 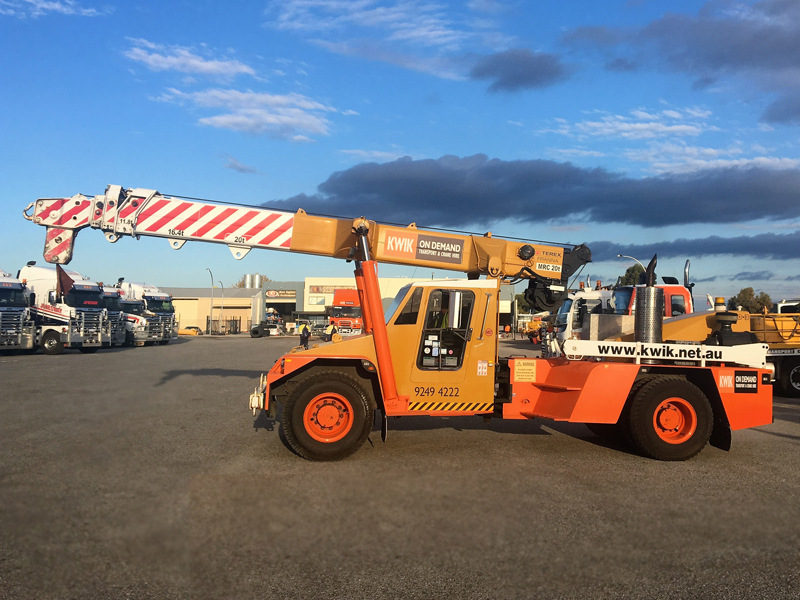 This crane boasts an ergonomically-designed interior cabin, auto slope and articulation deration, hydropneumatic lockable suspension, auto tyre pressure control and a Mercedes engine. 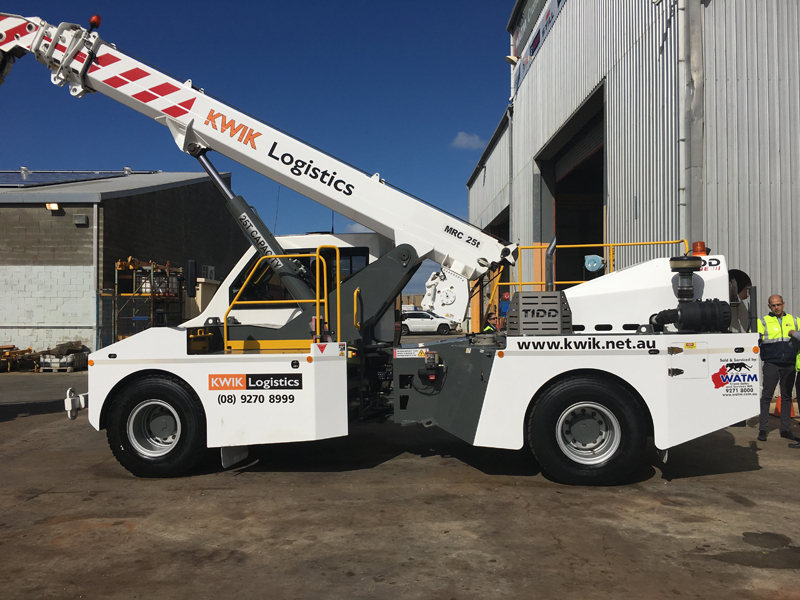 The TIDD PC25 is the newest edition to Kwik’s Pick and Carry Crane hire fleet and is an alternitve to our traditional fleet of Franna cranes. Kwik Logistics are experts when it comes to cranes and transport services. We are a family owned Perth business staffed by a team of passionate industry experts. Since the 1980’s we have been providing high quality cranes and advice to businesses, helping them achieve successful project outcomes. We pride ourselves on exceptional service and place a premium on safety. Call Kwik Logistics today and let us coordinate your next project, and share our expertise about cranes so you get your project done safely and efficiently. Get in touch for your free quote or site inspection today.